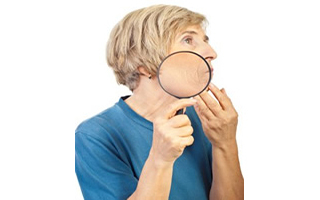 You may have noticed that as we age, our skin becomes drier and less elastic. That's because our bodies don't produce as much hyaluronic acid. Hyaluronic acid, as you may know, is a moisture-retaining acid that occurs naturally in the skin. But you'll also find it in some advanced skin care products to increase their efficacy. But does this really work? Does adding hyaluronic acid to skin care products really help increase moisture? A study from three years ago gave us the answer. In a 2011 study, researchers applied hyaluronic acid formulations around the eyes of 76 women. All of the women were between the ages 30 and 60 years old. The purpose of the study was to assess hyaluronic acid's effect on wrinkles and skin condition. In this study, the women applied the HA product to one eye for 60 days, but used a control cream around the other. The researchers measured their skin's hydration and elasticity before the study started, at 30 days, and again at 60 days. All of the women experienced a significant improvement in the skin around the eye receiving the HA treatment compared to the one that didn't receive any hyaluronic acid. The researchers also measured the women's wrinkle depth and found a significant improvement resulted from two of the hyaluronic-acid formulations as well. Clearly, hyaluronic acid has a lot to offer your skin. Hyaluronic acid is remarkable because it holds water in the skin, keeping it hydrated and moisturized. It works so well that many dermatologists use it in the injection products Juvederm and Restalyne. I really like hyaluronic acid and recommend it because it works. By providing your skin with hyaluronic acid externally, you can help restore a youthful appearance. You can supplement your body's slowing natural production of it by applying it topically. In the Système 41 Skin Care Kit, you'll notice the Eye Serum, the Night Treatment, and the Day Crème all contain hyaluronic acid. This kit is a great way to reintroduce hyaluronic acid to your skin. Many of our satisfied customers have seen a dramatic improvement in their skin elasticity and hydration in just a few weeks. You could too.